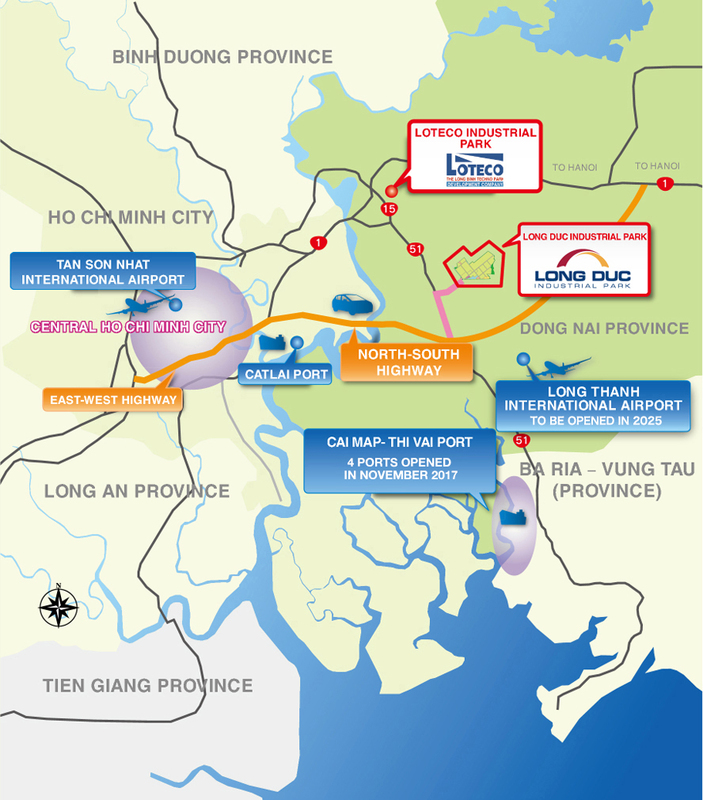 Lying in Bien Hoa City, Dong Nai Province, Vietnam, Loteco has a good location: closes to the National Highway No.1 which connects Hanoi Capital and Ho Chi Minh City, closes to the National Highway No.51 which links to Cai Mep-Thi Vai Port. It also takes only 40-50 minutes by car from Lotecco to the center of Ho Chi Minh City, Tan Son Nhat International Airport or Cat Lai Port which handles approximately 50% of containers in Vietnam. With the transportation convenience of airway, waterway and roads, Loteco is ideal to save transportation time and costs of materials, parts and productions. "To reduce the initial investment cost"
"To start producing at once"
"To start with small scale and consider its expansion in the future"
Responding to the needs above, Loteco has factories for rent which equipped basic infrastructures. Please contact us for more details. Long Duc Industrial Park is the second one developed and managed by Sojitz Corporation in Vietnam, which continues to success of Loteco. It has ideal location which takes only 50 minutes by car from Ho Chi Minh city center, almost 80 minutes from Cai Mep - Thi Vai Port, Cat Lai Port or Tan Son Nhat International Airport (after the opening of North-South Expressway in 2014). In addition, a sufficient infrastructure facilities system and the supporting of stationed Japanese staffs are the competitive advantages that Long Duc Industrial Park can offer to your business.